Mechanical-flow no-waste pig feeding is an Osborne trademark. Osborne first saw the challenges producers faced with wasteful pig feeding in the mid-1970s when most producers were using old-fashioned, gravity-flow feeders that required continuous adjusting and monitoring. No matter what even the most diligent producer did, feed waste on the floor or in the pit and labor to adjust and clean was inescapable. 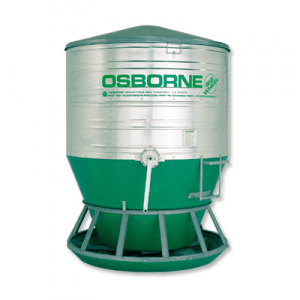 To combat these substantial costs, Osborne developed a new concept for the industry: mechanical-flow pig feeding. Mechanical-flow feeding works differently than gravity-flow feeders. The mechanical-flow design requires pigs’ interaction with the feeder—not gravity—to determine feed flow. Feed is delivered only when pigs are feeding, so it’s always fresh and clean. 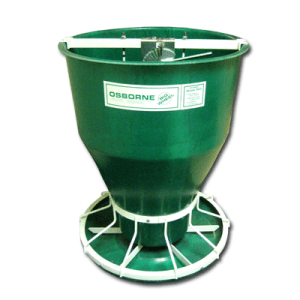 Producers quickly saw the benefit of mechanical-flow feeding and Osborne became the #1 supplier of quality hog feeders in the U.S. in the 1980s and 1990s. And now, with continual improvements, Big Wheel Feeders are again setting a new standard in all phases of production with their outstanding performance and longevity. Average on-farm feed waste with well-adjusted gravity-flow feeders is often 10% or more. User experiences have repeatedly shown that Big Wheel Feeder waste is measured at less than 2%. This 8% difference between even the best gravity-flow feeders and Big Wheel means substantial savings to your bottom line: enough savings to pay for your system of Osborne Big Wheel Feeders within a year—better than 100% return on investment! And this fantastic return can be taken to the bank year after year. Feed conversion beats traditional four-sided rectangular gravity-flow feeders because more feed is used for actual animal growth and not wasted in the pit. Pigs are spread radially around the feeder and large trough openings, which provides a less stressful eating experience and saves feed from unnecessary competition. Animals eat with less stress and finish faster with Big Wheels. Minimal feed waste and management time keep profits high by eliminating the main causes of feed waste with practically no human intervention required. Thousands of satisfied users agree: nothing beats a Big Wheel. 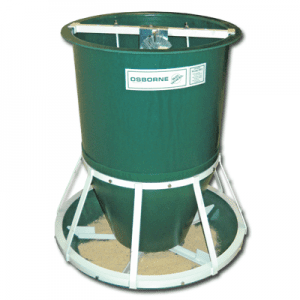 "Osborne Big Wheel feeders are easy to adjust for feed control with very little waste. They have little maintenance, don’t plug up, and are easy to clean. Little pigs don’t lay in them as much. 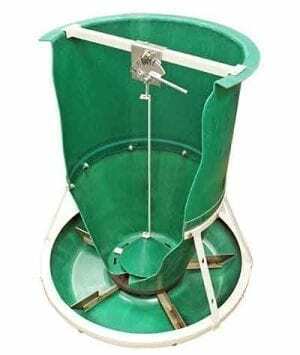 I think these feeders are good for wean-to-finish barns."